It is perfectly seasonable since we are still in April (besides today it is coat weather, again. ), but I can't help but feel that I am terribly behind in writing about a piece from the Chanel Rêverie Parisienne collection (spring 2015). That is kind of insane, but we are already seeing the summer collections everywhere. I am going through a matte lipstick phase right now (other than "the warm orange-y lipstick phase") and recently have bought a more than a few both from drugstores and higher-ends. 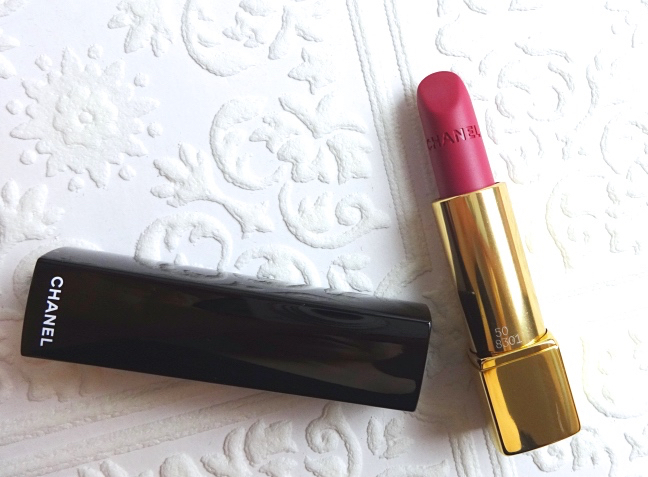 Being equally fond of drugstore lipsticks in general, I secretly hoped that my affordable acquisitions would be as good as Chanel Rouge Allure Velvet La Romanesque. Sadly but justifiably, the Chanel turned out to be superior in this case. La Romanesque is a muted fuchsia with plum undertones. 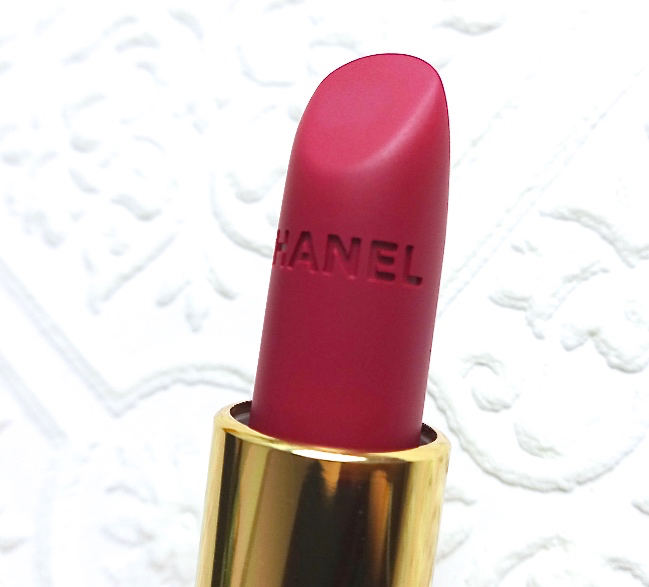 Chanel describes it as a "magenta". On my lips, it shows up brighter pulling a bit red. This swatch pic was made with single swipes. La Romanesque practically glides on and feels incredibly light on lips. It quickly sets to last for a very long time leaving a strong stain behind, like a tattoo. The color turns slightly darker on me, too. It does have that "shrink-wrap" kind of sensation which is quite common in long lasting formulas. Once set, it feels "tight" but not "dry", if that makes any sense. I like how gradually it wears off (I mean, minimally) that I never have to deal with flaking or peeling. I would have said this is the best matte formulation I've tried if I hadn't experienced the Tatcha lipstick. 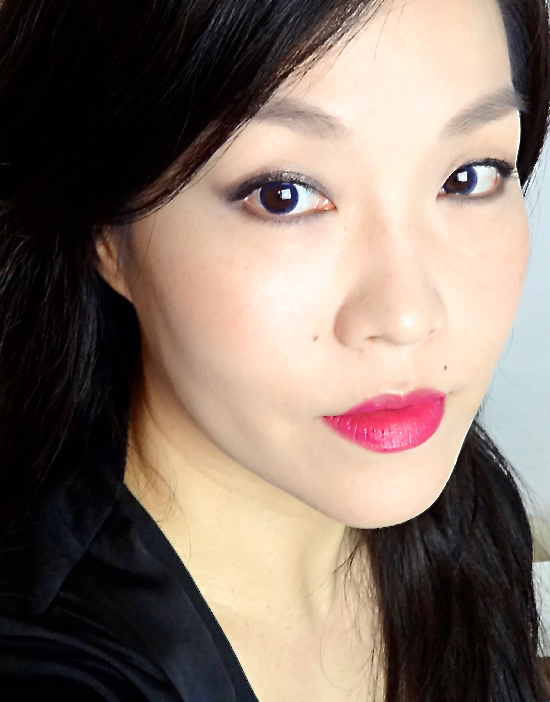 Here is an overall look with Chanel Rouge Allure Velvet La Romanesque. 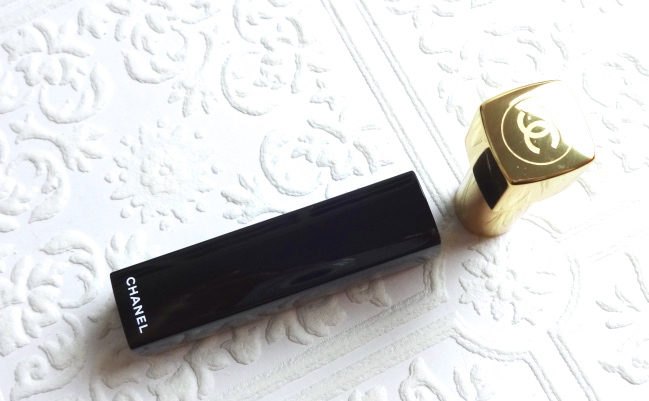 Chanel Rouge Allure Velvet La Romanesque is excellent both in color and formula. In fact, I am quite smitten with the formulation that I am considering to get her sister, La Petillante, which is a stunning matte coral that will satisfy my current lipstick cravings. Are you still enjoying the spring makeup? Or are you already into bronzers and summer brights? It's lovely on you! I've been debating getting this since it came out. I'm glad it's permanent though! I get what you mean about the formula feeling "tight", it's similar for me with Mac Retro Mattes. I only have one MAC Retro Matte (Ruby Woo), but I must say the Chanel feels much lighter on lips although I don't think the MAC is THAT drying. I'm so glad you got this! I've been campaigning pretty hard for everyone I know to take a look at it LOL Love the shade on you! I've noticed that La Romanesque looks a bit different on everybody, but I've never seen it look bad! I have to agree this amazing color looks a bit different on everyone yet so pretty. I'm so sad that it's still coat weather there! I heard from a friend that it's still snowing where I used to live! This winter is harsh! This entire week has been so cold and today it's quite windy. Luckily I have heating in my apt and only have some paper work to do, which is a good thing. Exactly! Matte finish adds such an elegance to something that could look totally gaudy if in glossy finish. I started wearing bright colors more and this great improvement in matte formulation really enables me. I want to explore more! I shouldn't be even reading this post because I have been wanting this lipstick for so long! And I have managed to resist for so long. It looks stunning on you and the color is sheer perfection! After the initial sheen wears off, it is a totally different color and it lasts for a long long time. I find it so interesting and practical at the same time. Love it on you! Perfectly Lena shade! I have this too! It's a bit darker on me, but I still love it! I agree, the formula is superb, darn it hahaha! OH it's beautiful! I love this formula from Chanel. Thank you! I love the whole Rouge Allure line. They wear so well! I might get my first Chanel lipstick soon ( I'll have a transfer at Paris on my trip to Jakarta next week and already have a long list for duty free shopping :p ) but I am still not sure whether to get this Rouge Allure Velvet range or Rouge coco shine..
beautiful color on you. I am also into matte lately but I don't like the drying-out feeling with most of mine. It is good that this one leaves a tint behind. I am lazy in re-applying and having some tint on my lips means fewer touch-ups. Even though it shrink wraps (good call on the terminology there! ), it looks glorious on your lips! I LOVE this lipstick packaging. It's my favorite ever! Rouge Allure packaging is my favorite, too! It is everyday functional yet so chic. I know what you mean by "too many lipsticks". I am trying to blog about other things than lipsticks, but it isn't all that easy since I almost impulsively buy lip stuff. Beautiful! I still haven't tried Chanel lippies yet. Though the more you post the more tempted I get. The reformulated Rouge Coco is pretty good, but my current favorite range is definitely Rouge Allure. :) Give them a try! I am glad that La Romanesque become permanent, too! I hope other Rouge Allure and Rouge Allure Velvet are as good as those I've tried so far, because I want to try a few more soon. Rouge Allure line excites me more than the reformulated Rouge Coco for some reason. Wow, that color is gorgeous on you! I love a good pinky red lipstick. I have a few drugstore colors that look similar, but I'm guessing the Chanel is a little nicer, haha! La Romanesque is a brightening shade but has a nice depth to it, which makes it a quite unique color. One of the drugstore mattes I recently bought is stunning in color but it gets dry and crackly. I think this matte fuchsia/berry would work nice in hot weather. Glossy intense lips in humidity is cumbersome, right?